Chemical Precipitation Water Treatment Process consisted of a chemical addition and clarification. 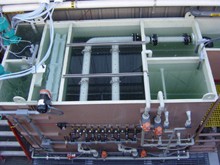 Depending upon the metals and presence of complexing agent, one or two reaction tanks are designed into the process, followed by a flocculation tank and clarifier. Our design concept for the Clarifier utilizes Stock’s law for settling the flocculated particles, utilizing cross flow (horizontal flow) as well as Up-flow (vertical flow). Vertical flow is utilized for package system, where the space is limited. Our package system consisted of all reaction tanks (pH adjustment and Flocculation), clarifier, sludge holding tanks, and clear well for sampling and monitoring of system’s treated wastewater discharge, all in one skid, pre-plumbed and pre-wired, making it easy for very fast installation. The Horizontal flow is used for higher solids wastewater such as polishing wastewater from disc manufacturer. This Clarifier is a standalone system and is normally used for high flow rate application in range of 100 to 120 GPM. The up-flow clarifier as a standalone system up to 1000 GPM can also be incorporated into the treatment system. As a polishing step, Ion Exchange Technology is used to remove trace metals from the effluent of precipitation process. However, the selection of this ion exchange resin is quite important, as for such application the ion exchange system should be designed only to remove the specific metal in question. Therefore, rather than using generic Cation Ion Exchange resin, which will remove all Cations, a selective ion exchange should be employed to avoid frequent regeneration. The effluent from the precipitation process is normally directed to a Neutralization or to what is normally referred to as AWN.